I’ve had occasion to write about the problem of healing, or lack thereof, before on this blog. There are a number of challenges for modern Christians when they read reports of miraculous healing in the Scriptures. First, trained as we are to think in largely physicalist parameters, conceiving the universe as something of a closed continuum, there is our initial skepticism that the miraculous is even possible. Of course, there are formidable arguments against this view, and we appear to be less hostile to the miraculous than we have been in generations past. And so for many of us, the problem is far different. 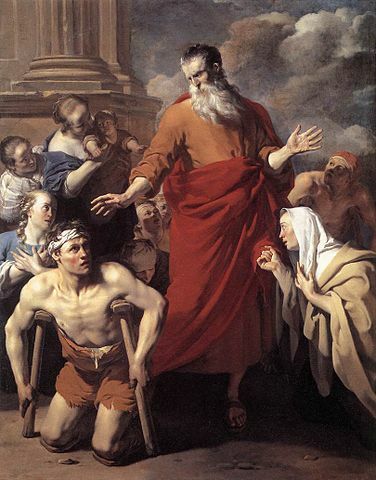 We admit that if there is an omnipotent God, it’s easily possible for him to heal. The question for us is “why doesn’t he do so as he used to?” We read the New Testament and find a wealth of reports of physical healing on an extraordinary level. The blind gain sight, the lame walk, the deaf hear, and even the dead are raised. And this is not only Jesus in his ministry pulling off fantastic feats like this, but in that of the apostles. Paul could blow his nose, drop his handkerchief, and God would use that rag to heal people of diseases and cast out demons. If that’s the case, then why not more? Why does it seem relegated to then and there and not here and now? We’re just as sick as they were in the 1st Century. We know people who would come to believe if they saw someone healed, so why don’t we see more? Is it, as so many faith-healers and their like teach, simply a matter of our weaker faith? Do we remain ill because of our faithlessness? This last week I had the honor of sitting in a small Q&A discussion with theologian Henri Blocher as he’s in town giving the Kantzer lectures in Revealed Theology at TEDS. His topic his been related to the problem and possibility of evil, so naturally some of our questions turned there. One fellow student asked him just that question. He responded with three general lines of thought, which I’m going to relay in an artificial order and much more poorly than he originally articulated it. First, he pointed out that we’re often victims of optical distortion when it comes to our reading of the New Testament evidence. While it’s true that there are many instances healing in the early the Church, we often ignore the evidence that points us in the other direction. For instance, while it’s true that Paul had a powerful ministry of healing, we also read him write in his final greetings in his second letter to Timothy that he had “left Trophimus, who was ill, at Miletus” (4:20). Now, if healing was as automatic and plentiful as all that, it seems that Paul–handkerchief healing master–wouldn’t have left his co-worker for the gospel sick, now would he? Second, Blocher pointed out that, while not restricted to this situation, miraculous signs and wonders seemed to accompany the inbreaking of the gospel into a new mission ground as a sign of its truth. Then, upon the establishment of the Church in that area–miracles may not die out entirely–but Christians themselves, in their holy living, are to be the chief signs of the gospel. Depending on how charismatic you are, you’ll find that one more or less convincing. Finally, humble and cautious as he tends to be in any area of theologizing that isn’t closely grounded in the text, Blocher reminded us that we are ultimately dealing with the wisdom of our free God. Our God is personal and supremely so–Father, Son, and Spirit–and so he responds to our prayers with the discretion and care of one who can say yes and–at times-no, according to his own good plans. Any theology that expects God to act on command has forgotten that it is dealing, not with a dispensing machine, but with our saving Lord. We must, for these reasons, be careful about speculating about the faithfulness of our brothers and sisters who pray for healing and yet do not receive it. Nor should we be quick to doubt the infinite goodness, power, and love of our God who has healed us of our most grievous ills–sin and death–by suffering these ills himself, on our behalf, in the man Jesus Christ. I imagine it must take an extraordinary amount of faith not to. Healing seems to be in such short supply. And why stop the miracles before they could be documented by more reliable means than eyewitness accounts? Hard pills to swallow. The Trophimus passage is an interesting one, and not one I’d read. So easy to gloss over, but adds important nuance. It’s little bits like that that make the Bible endlessly fascinating.